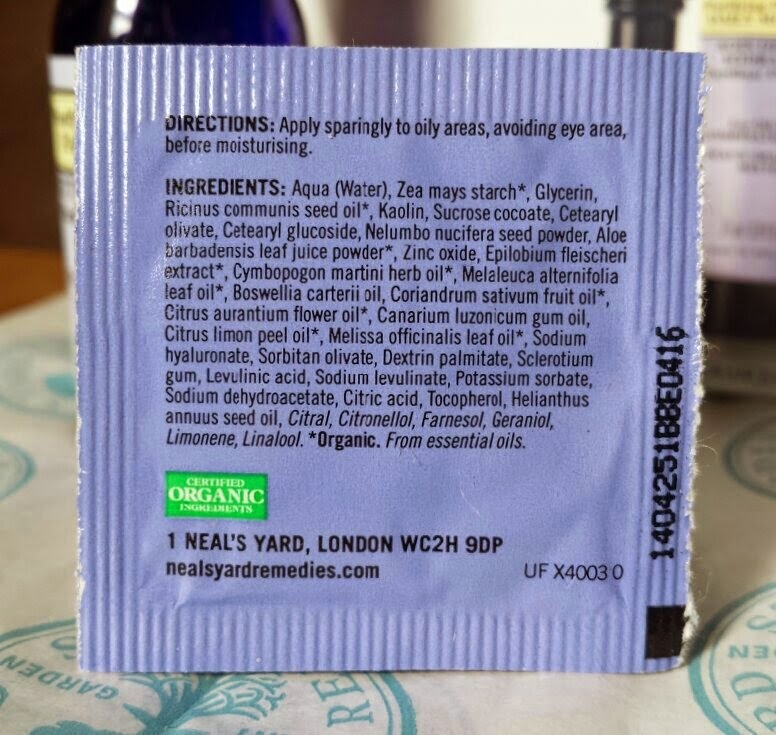 All of Neal’s Yard Remedies products are natural and organic and are free of parabens, silicones, synthetic fragrances and phthalates amongst many other things. They also don’t test on animals. 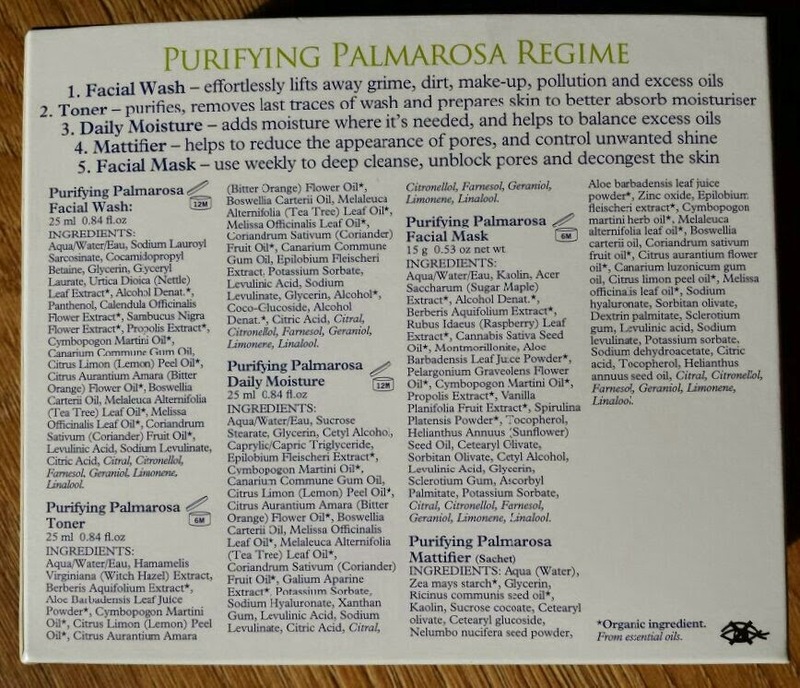 I grabbed myself an Oily & Combination Skincare kit which features products from their Purifying Palmarosa range of products. The Purifying Palmarosa Facial Wash is a facial cleanser that deeply cleanses oily and combination skin to remove impurities without stripping natural oils. It contains palmarosa oil, nettle leaf extract, tea tree oil, calendula extract, elder flower extract, lemon oil, frankincense oil and propolis extract amongst other oils and other natural ingredients. 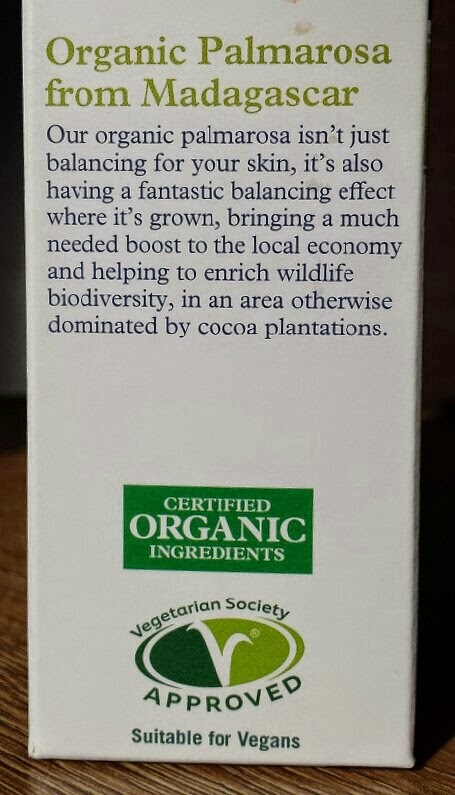 It is of 83% organic origin. The miniature comes packaged in a small blue bottle with a black screw lid. 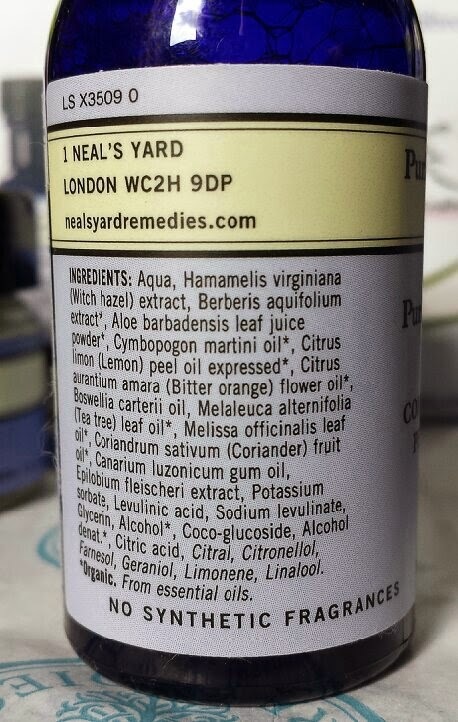 It has a simple label around the bottle which is of the same style to other Neal’s Yard Remedies products. The wash itself is a clear liquid and it has the smell of the essential oils that are contained in it. The full size comes in a blue, pump lid bottle that contains 100ml of product. To use you need to dispense a small amount of the wash onto your hand and then gently massage into the damp skin of your face. You then need to rinse it off with cool water to close the pores. It lathers up really well, so only a small amount of wash is needed to cover the whole face sufficiently. Once rinsed and dried, your skin instantly feels cleansed, soft and slightly mattified. Overall I think that this is a great facial wash. It is decongesting, so the skin feels clear and comfortable after use. It also helps over time with blemishes, but it isn’t an overnight treatment so do expect to be patient. The oil balance of your skin also feels more neutral, so shine is lessened. The other products in the range have more of a focus on reducing shine though, so I shall discuss this in more detail further on. 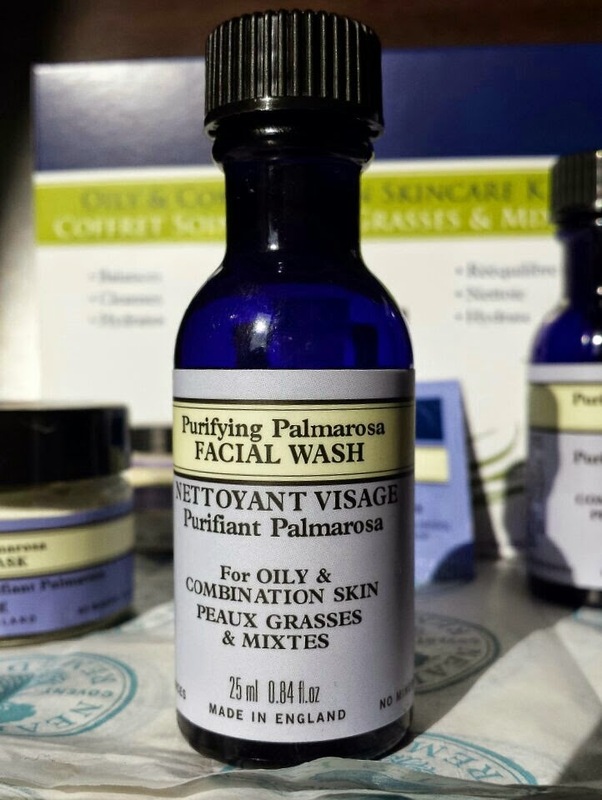 A full size bottle of the Purifying Palmarosa Facial Wash is £15.50 for 100ml of product from Neal's Yard Remedies. 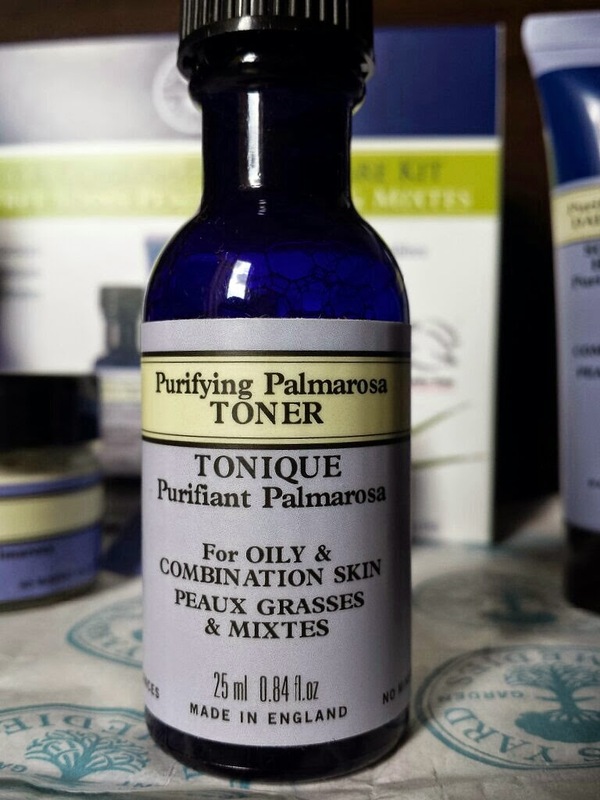 The Purifying Palmarosa Facial Toner is a refining and decongesting toner for oily and combination skin. It is an astringent toner that cleanses and helps to remove the last traces of makeup and grime and also minimises the appearance of pores. It also contains clarifying mahonia and alpine willowherb that help to refresh the skin and to balance oil. In addition to these, it also contains witch hazel, aloe vera, tea tree oil and palmarosa oil as well as other essential oils, extracts and other natural ingredients. The miniature bottle contained in the kit comes packaged in the same type of small blue bottle with black screw cap as the facial wash with the similar label. The toner itself is a clear fluid that also smells of the essential oils included in the formula. To use you need to shake the bottle well, apply a small amount to a cotton pad and gently sweep across the face. The great thing about this toner is that as soon as the toner absorbs (which is very quickly), your skin is instantly left looking more refined and slightly more matte. In addition to that, it doesn’t feel heavy at all like some products can and it feels nice to know that everything is natural and good for your skin without any additional chemicals. When you apply something good to your skin, something inside feels good too. The smell may be off-putting to some, but I quite like it. The fragrance free aspect means that you can smell the essential oils included in the toner, but if it is a little off-putting for you then it’s probably the right time to note that you only smell it during application. You can’t smell it afterward. This is a fantastic toner. It’s the lightest toner that I have used and it makes the skin feel really… brilliant. Along with that, it makes the skin feel cleaner too. It really does stand by all it’s claims and it definitely gets a gold star from me. A full size bottle of the Purifying Palmarosa Facial Toner is £15.50 for 200ml from Neal's Yard Remedies. The Purifying Palmarosa Daily Moisturiser is a lightweight, mattifying moisturiser for oily or combination skin. It contains alpine willowherb, elemi and palmarosa to help balance excess oil on the skin. This moisturiser also helps to minimise the appearance of pores as well as providing your skin with nourishment. The miniature version of the moisturiser comes bottled in a small, blue squeeze tube that holds 25ml of product and is styled like most other Neal’s Yard Remedies products. The full-size comes packaged in a blue bottle with a pump-lid that holds 100ml of product. The cream itself is white and quite watery. However, the watery texture does help it to spread further across the skin so I see that is more of a pro rather than a con. With that said, the small squeeze tube packaging can make it very easy to over dispense the cream due to the watery-ness. If you decide to buy the discovery kit then that could be good to keep in mind when you first use it! When packaged in the pump bottle though, I can’t see it being much of an issue at all as you can easily manage how much you dispense this way. Upon application, your skin instantly begins to mattify. The cream absorbs quickly, so as you are massaging it into your skin you can sort of feel the texture of your skin changing. In a good way, of course. The moisturiser leaves your skin feeling really soft and smooth as well as looking matte. The downside though is that the matte effect only lasts a couple of hours. Therefore, if you are looking for a longer lasting answer, then you may need something more. Thankfully, though, this discovery kit just so happens to provide that something extra that compliments this product perfectly for results that outlast a couple of hours. I’ll explain more about that further on in this post. Overall, it is a great moisturiser. It is lightweight and doesn’t leave any heaviness on the skin. That’s a great thing for people who suffer with oily skin as everything can feel quite heavy. 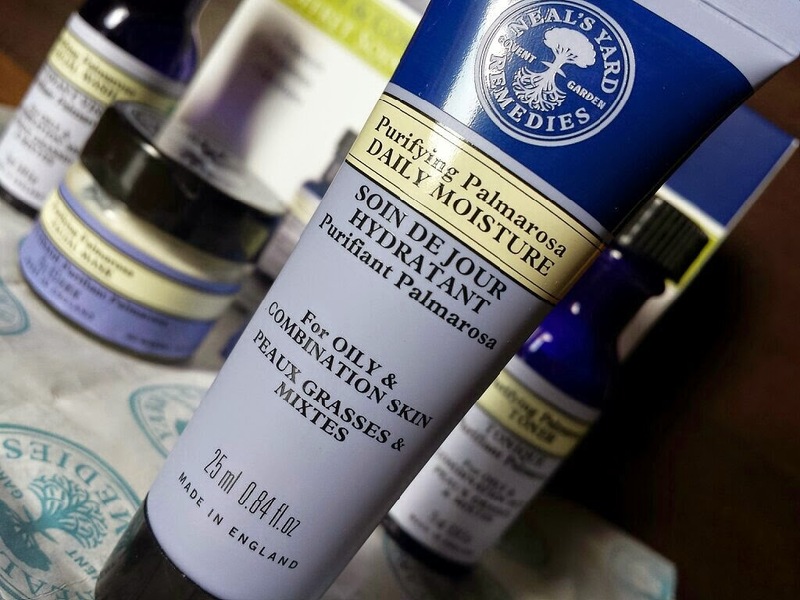 A full size, 100ml bottle of the Purifying Palmarosa Daily Moisturiser is £23.75 from Neal’s Yard Remedies. 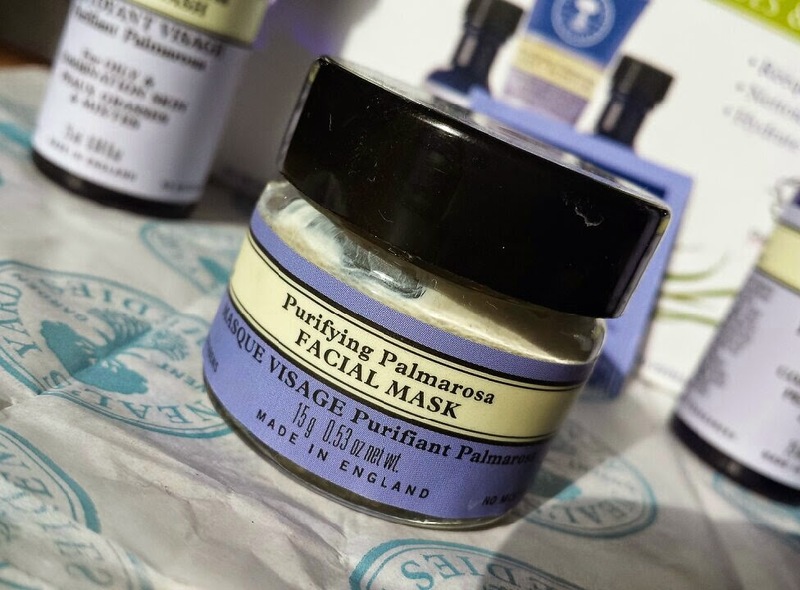 The Purifying Palmarosa Facial Mask is designed to deeply cleanse oily and combination skin. It is also designed to remove impurities, minimise the look of blemishes, rebalance oil levels and to detoxify so you are left with fresh and radiant skin. It contains geranium oil, raspberry seed oil, hemp seed oil and mahonia extract as well as green clay, aloe vera and of course, palmarosa oil. The sample jar comes packaged in a small, glass jar with a black screw cap lid and it holds 15g of face mask. The full size comes in a larger version of the same jar and contains 50g of product. The mask itself is dark brownish-grey and is a smooth, thick texture. To use, you need to apply a thin and even layer to clean skin, avoiding the eye area and the mouth area. Leave it on for around 10 minutes and then rinse well and pat your skin dry. It is recommended that you use this once a week to keep the skin "clear and balanced." My immediate impression of this face mask is that it has a rather strong scent to it. As with the rest of the collection, there are no fragrances added. Therefore, the mask smells of a combination of the ingredients included. Application is easy and simple and it is the type of mask that does dry on the skin and hardens. There are no tingly effects during use and the skin stays feeling comfortable. Removal can be a little more difficult. It can be a tad stubborn to remove in certain areas such as around the nose. However, once removed, your skin feels instantly clean, comfortable and matte. I find the effects of this mask to last a long time as well. Once a week is definitely sufficient enough to really help see a difference with your skin. I have been using this once a week for around five weeks now and my skin is really reaping the benefits. The full size jar holds 50g of product and costs £25.75 from Neal’s Yard Remedies. The Purifying Palmarosa Mattifier is an oil-balancing treatment that provides lasting shine-control for oily and combination skin. It helps to keep the skin looking mattified and it also reduces the appearance of pores. It contains mattifying kaolin, organic alpine willowherb, organic corn starch and palmarosa. The sample comes packaged in sachets. This box contains two sachets, but each holds enough to last a few applications. The full size product comes packaged in a 30ml, blue, pump lid bottle. This product is to be used after toning, but before moisturising. Neal’s Yard Remedies also say to use is sparingly on areas where you most experience oily skin and to avoid the eye area. I have found that you really only need to use a small amount on the areas that you need it most. It absorbs very quickly as well, so a quick hand is ideal during application. With that said, I still recommend waiting a couple of minutes after application before applying your moisturiser. When your use the Purifying Palmarosa Daily Moisturiser too soon afterward, I have found that the mix of the two products can cause an odd, thick white… smear. I would say paste, but so little of it appears that it does look like a tiny smear on the skin. However, this does blend straight back in very easily, and when it has done so the skin is left very soft and matte. It can be a tad annoying having to spend a little extra time having to re-blend though, hence why I suggest waiting a couple of minutes. Putting that aside, this product for me is the stand out of the collection. I have used products that claim to mattify the skin in the past, but none have worked as well or for as long as this one. Sometimes a product such as this can make the skin look dull, but this doesn't. Most of the time a product such as this stops working after a couple of hours, yet this one doesn’t do that either. Maybe it depends on how oily your skin is in the first place. Mine is very oily so mattifying products never work for long. This one however lasts a good few hours. That's quite magical for me, so I cannot help but to praise this mattifier enough. 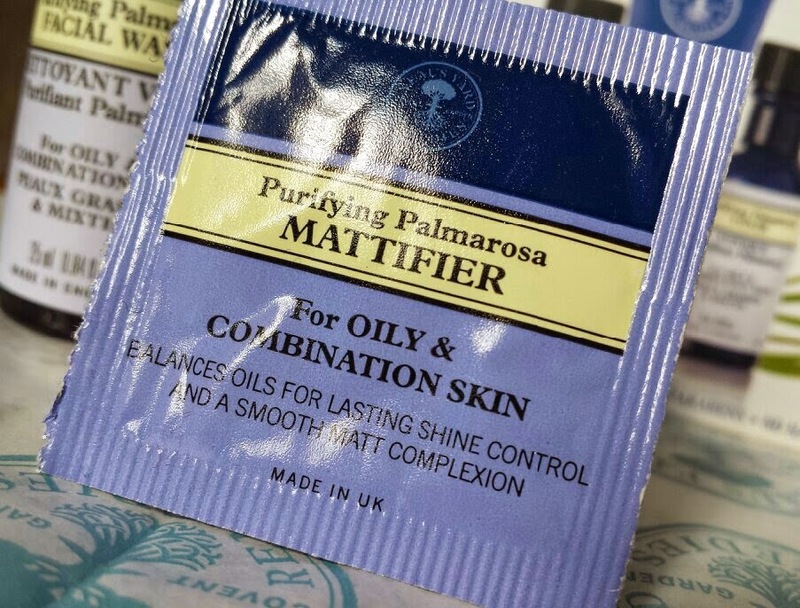 You can buy a full size, 30ml bottle of the Purifying Palmarosa Mattifier for £31 from Neal’s Yard Remedies. Overall, the collection is a fantastic one. I’m genuinely so smitten with it. I have noticed a great difference with my skin since using and I think that this is a range that I’ll be sticking with for quite a while. Speaking specifically about the Purifying Palmarosa Mattifier for a second, singling this out as the stand out product really does show the quality of it. The collection as a whole is so top notch that to claim that one part of it is the stand out really does mean that it is incredible. Oily skin is one of the major banes of my life. Anyone else who suffers with it will probably agree, and to them I recommend this collection with the utmost highest regard. The combination of the products work so well together as well. Over time you really can see a difference with your skin. If you suffer from blemishes you can also see a difference in that area too. I don’t suffer with major blemishes all over the face nowadays (thankfully that extreme was left behind in my teenage years), but I can still accumulate a few on bad skin days. By using this collection together, your skin begins to feel less ‘clogged.’ Because of this, the skin feels much cleaner throughout the day and blemishes gradually disappear and come back far less frequently. 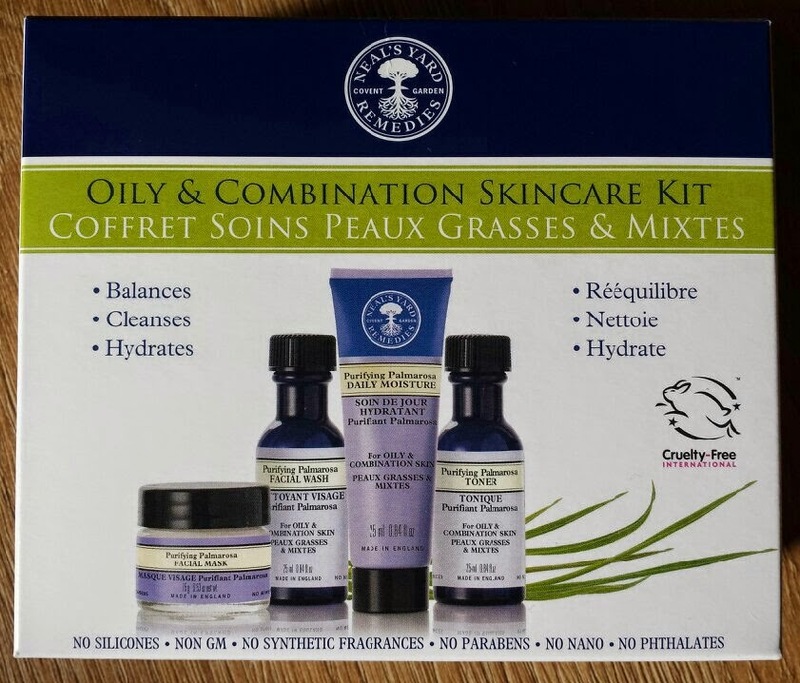 This Purifying Palmarosa Discovery Kit is an amazing collection of miniature products for you to test out in the comfort of your own home without having to splash out on all of the full size products initially. You can grab yourself a Purifying Palmarosa Discovery Kit for just £15 from Neal’s Yard Remedies. You can also take a look at the other collections available to buy as discovery kits here. 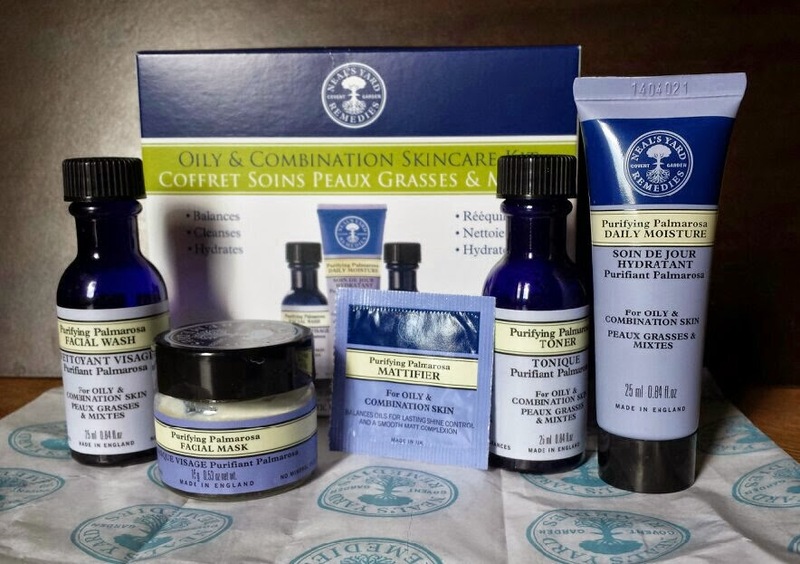 What are your thoughts on the Neal's Yard Remedies Skincare Discovery Kits?